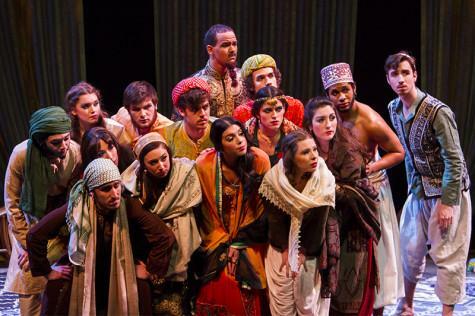 The cast of Arabian Nights in dress rehearsal. 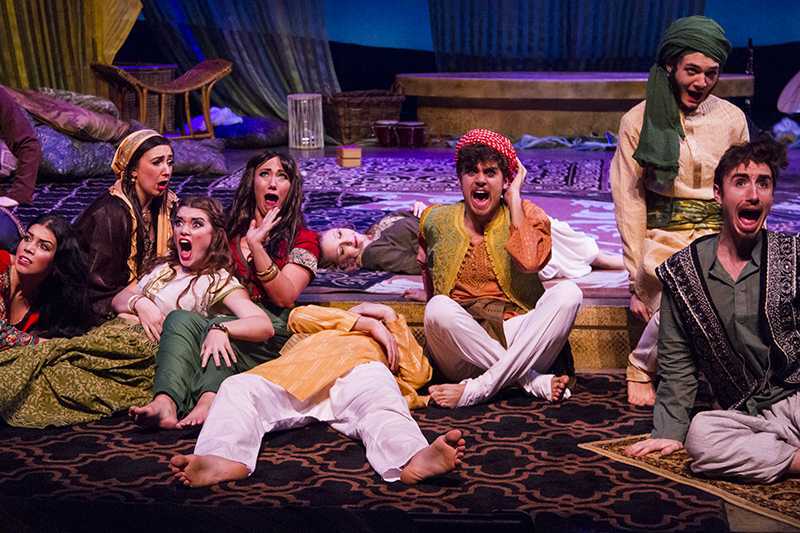 Everything from the rich colors and fabrics that dress the stage to the enchanting costumes will transport the audience from snow-ridden Northern Kentucky to the exotic deserts of Arabia when the curtain goes up in the Corbett Theatre Thursday night. Students and staff have been working for months to bring to the stage Arabian Nights; the exciting tale of Scheherazade, a woman who uses 1,001 tales to not only stop her husband, the sultan, from killing her, but to in the end also tame his heart. Below are some spotlights on just a few of the many people involved in bringing this story to life. Director Brian Robertson was a “last-minute replacement” director when the original professor assigned to the show had a schedule change. Robertson said a production like this, which incorporates so many different elements of storytelling, is what he likes most about theatre. Robertson has been very impressed with the “depth of student involvement in the theatre department” and said that students do everything from stage management to tech staff, design, lighting and the cast. The cast of Arabian Nights look on. Tiffany Rusch, senior BFA dance major, is the co-choreographer working on this production for her exit senior project and is excited for people to see the show. Rusch has been working with the music director and the stage manager to come up with unique dance numbers that will help tell the story and said everything has been a collaboration. Rusch said her favorite part is in the very beginning of the show. “How the whole show starts is really cool and I think no one’s going to see it coming,” Rusch said. Rusch said she feels people are sometimes afraid to step out and try something new, but coming to a live show is different than seeing a movie. Andy Burns, freshman musical theatre major, is the musical director for Arabian Nights and has been working on the music for this production since November of last year. Burns said he was in South Pacific and was approached by the stage manager who said they needed someone to write and direct the music for Arabian Nights, and they wanted to see if he was interested. Burns said this is the third show he’s worked on and he feels really lucky, but echoes Rusch when he said this show is a little different. One of Burns’ favorite parts of the show is a song toward the end of the first act about farting. Burns said it’s been a lot of fun writing a song and doing a dance about farting. “I’m five-years-old so I think that’s hilarious,” Burns said. Burns said that as actors and performers, they don’t just tell stories, but tell stories they feel have to be told. year working Costume design, technology and makeup in the theatre department. For Arabian Nights, Chamberlain said most of the costumes were ordered in November from India, Saudi Arabia, Pakistan, Yemen, Iraq, Iran and Afghanistan. Chamberlain said that a lot of the details come from the costumes since the scenery in the show are mostly drapes and pillows. “A lot of the detail as far as shape and line and texture really come through in the costumes,” Chamberlain said. Chamberlain said a lot of the costumes are have elaborate beading and rhinestones and detail that most people may not notice. Also, everything from the actor’s facial hair or hair cut to the jewelry or undergarments is carefully thought of and planned by the designers. 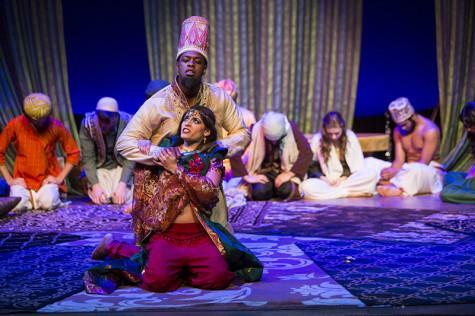 The curtain goes up for Arabian Nights Thursday night at 7 p.m. in the Corbett Theatre.